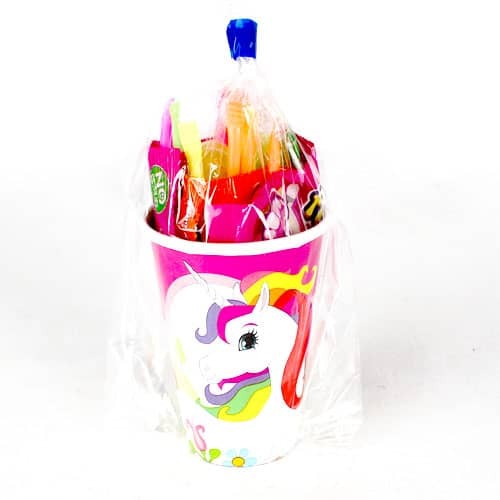 Sold in a unicorn cup bursting with sweets . Double Lolly: Sugar, Stearic Acid, Modified Starch, Acidity Regulator: Malic Acid, Cornflour, Magnesium Stearate, Flavourings, Anti-Caking Agent: Magnesium Carbonate; Colours: Anthocyanin, Copper Chlorophyllin, Curcumin, Lutein, Paprika. Fun Mix: Glucose Syrup, Sugar, Gelling agent: Gelatine; Modified Starch, Acidity Regulators: Citric Acid, Trisodium Citrate; Flavourings, Apple Pulp(contains Preservative: Sulphur Dioxide), Glazing agents: Vegetable Oils( Palm, Palm Kernel, Coconut), Carnaubawax; Colours: Ammonia Caramel, Anthocyanin, Copper Chlorophyllin, Lutein, Paprika. Teeth and Toothbrush: Sugar, Glucose Syrup, Gelling Agent: Gelatine; Modified Starch, Flavourings, Acidity Regulators, Citric Acid, Trisodium Citrate; Apple Pulp(contains Preservative: Sulphur Dioxide), Glazing agents: Vegetable Oils( Palm, Palm Kernel, Coconut), Carnaubawax; Colours: Anthocyanin, Lutein, Paprika. Sour Lolly: Glucose Syrup, Sugar, Citric Acid, Malic Acid, Natural Colours(curcumin, anthocyanins, plant extract-spirulina), Flavourings. Traffic Light Lolly: Sugar, Glucose Syrup, Citric Acid, Flavourings, Natural Colours(anthocyanins, curcumin, paprika), Plant Extract(spirulina). May also contain soya and milk.